Nothing raises the awareness of what drug- and surgery-free chiropractic care offers those struggling with chronic pain like recognition from our peers. First came the American College of Physicians’ call to consider chiropractic care as your first line of defense in treating back pain. Then came a study of active-duty military personnel that showed moderate short-term relief when chiropractic care was used with standard care. According to the 2017 Gallup-Palmer College annual report, 78 percent of Americans already want to try alternative methods before going on prescription and OTC painkillers. And since September is Drug Free Pain Management Awareness Month, it is the perfect time to touch on all that a chiropractor offers. Today’s chiropractors have more resources than ever up their sleeves, some involving new technologies and others drawing on more traditional lifestyle choices. 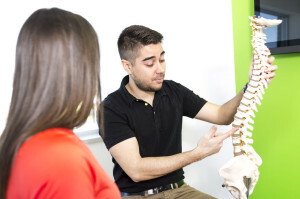 Manipulating the spine strengthens the connection between the central nervous system, the brain and the body. It helps your body heal itself, especially when coupled with physical activity and nutrition, which your chiropractor can recommend for you. Keep in mind, too, that this probably didn’t happen overnight and will take time and repeat visits for you to fully experience chiropractic care’s full relief. Instead of simply putting a bandage on your pain, your chiropractor will work with you to see what caused the problem and what you can do to keep it from coming back. It may mean new shoes, a more supportive pillow or learning a new way to lift those heavy boxes at work. But our guess is that you’ll learn how to adjust your posture, find ways to break out of your sedentary lifestyle and make some adjustments to the technology that occupies so much of our time these days. As with any health issue, the sooner you bring back pain to your chiropractor’s attention, the less risk you take of it developing into something unbearable. We know any pain in the back will make you miserable but early intervention could help you dodge the disabling chronic-pain bullet. And the simple act of seeing the chiropractor first lessens your chance of becoming addicted to prescription painkillers or undergoing surgery. Ready to see a chiropractor? Start by asking your friends who they see or asking your primary physician for a recommendation. Then find out for yourself what has brought our health-care peers forward. You do have options, and chiropractic care is a good place to start.